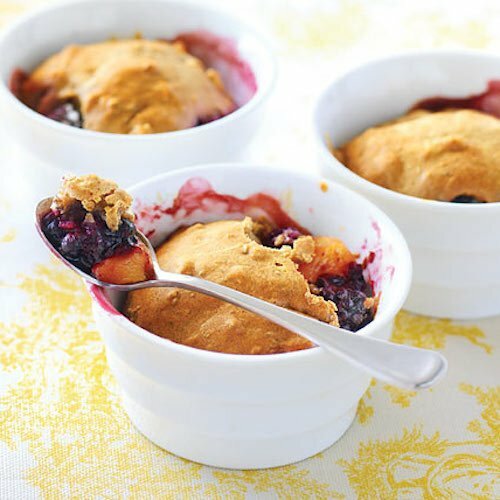 From the Kitchen: Peach and Blueberry Cobbler | Stahancyk, Kent & Hook P.C. Peach and blueberry cobbler just waiting to be tasted! In the mood for something sweet? Try making this delicious fruit cobbler! Not only is this dessert simple to make, it’s also great served hot or cold. Melt butter and spread in a 13 x 9 inch oven-safe dish. Combine flour, white sugar, baking powder and salt. Add milk and stir until all ingredients are moist. Pour this batter over the buttered dish. Bring brown sugar, peach slices, and lemon juice to a boil over high heat, stirring constantly. Pour over batter. Sprinkle with cinnamon and nutmeg to taste. Serve warm, topped with ice cream. Feel free to include other fruits and berries, such as apples, blackberries, and boysenberries.